New scantron form required for every quiz F-289-PAR-L, see below. 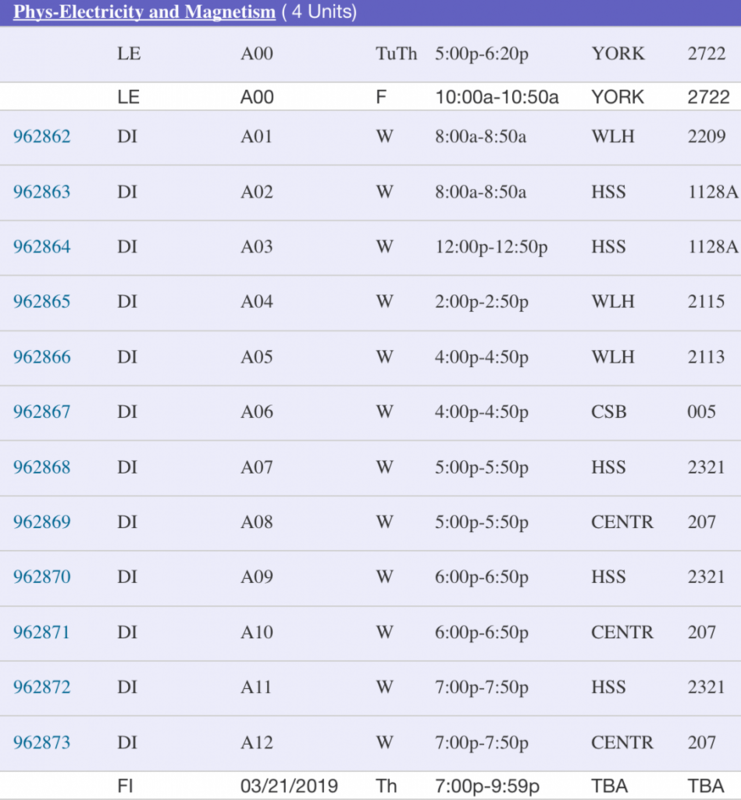 Final Exam Thursday 03/21/2019 7:00 pm – 9:59 pm Room York 2722. Absolutely no make-up final exam. See The UC San Diego Schedule of Classes for enrollment information and updates. Enrolled after the class has started? You are responsible for reading all announcement on the posted lecture notes. Also see the Academic Calendar for information on class dates and holidays. Physics 2B is the second quarter of a four-quarter introductory physics sequence. The course is aimed at students majoring in science and engineering (e.g. chemistry, molecular biology, computer science, mathematics). Physics 2B is a continuation of Physics 2A covering charge and matter, the electric field, Gauss’s law, electric potential, capacitors and dielectrics, current and resistance, electromotive force and circuits, the magnetic field, Ampere’s law, Faraday’s law, inductance, electromagnetic oscillations, alternating currents and Maxwell’s equations. Prerequisites: Physics 2A or 4A and Mathematics 20A-B. Corequisites: Mathematics 20C (prior completion of mathematics corequisite is permitted). There will be calculus. Please note: If you didn’t have Physics or electromagnetism courses in high-school this will be the hardest course in your life so far, but I am here to help you succeed! I will follow Eric Michelsen‘s course of SP’13 and W’14, including his course materials. I also encourage you to check out his book: Quirky Quantum Concepts. This is a required textbook/online homework: Mastering Physics for Physics for Scientists and Engineers: A Strategic Approach with Modern Physics, Fourth Edition by Knight. Chapters 22-32, Electricity and Magnetism. Instructions to setup your “Mastering Physics” homework on TritonEd: Pearson Instructions for PHYS 2B annotated . Mastering Physics plus eText $62.5 when purchased online through TritonEd. Students receive two weeks of temporary access to Mastering Physics. They can select this option during the registration process. Students have the option to purchase with a loose-leaf copy of the full textbook within Mastering Physics for $86.75 with free shipping. I highly recommend this option for those students who want a print textbook. It’s a great deal for a full Physics textbook. Tech Support: please have students review the attached tech support document for troubleshooting if they experience technical difficulties. You should check all your grades as they are posted. You must notify me of any grade questions within 1 week of their posting. The Physics department has its very own scantron reader. The new machine will not read the old form (X-101864-PAR-L). Instead you must start using the F-289-PAR-L form. It looks very similar to the old form (both are red half sheets). This is how the new scantron form looks. Quiz 1 will be on basic Math/Physics skills. See Mastering Physics assigned Math/Physics Skills Modules. “You are often required to answer some questions online on Mastering Physics before we cover it in class. This is to encourage you to read the material before we cover it in class, which makes the discussion much more productive. These questions are called “prelecture assignment”. The purpose of homework is to help learning. To understand the material, you must practice solving problems. Prelecture assignments on Mastering Physics are assigned roughly twice per week. Other homework is assigned weekly. All the online homework is graded and for credit. The first step in solving a problem is often the most difficult, so it is very important for you to start work on your own. Studying in groups may be valuable, but it cannot completely replace working on your own. Problems given on the weekly quizzes will resemble the homework and iClicker questions. The textbook contains numerous worked sample problems, and a number of questions and exercises at the end of the chapter. Learning physics is about understanding why a solution works, rather than just getting the correct numbers. Blindly plugging numbers into formulas is useless. Prelecture assignments and homework will be added/updated throughout the course, see Mastering Physics through your TritonEd account. “The classroom response system is used to stimulate discussion and thought throughout the lectures. You must bring your iClicker to every class. Responses are a small part of your grade, though credit will be given for any overall effort judged significant. The point is thinking, not necessarily getting right answers all the time. Please think for yourself, as that will improve your grade on other materials (rather than letting others think for you). Don’t distract yourself searching the book for the “right” answer; that only hurts you. Instead, think for yourself. Registering your iClicker: You must register your iClicker on TritonED by the 2nd week to get credit. Use your full 9-character student ID, starting with “A”, and the full 8-digit clicker ID, including any leading zeros. On the left list, choose “Tools”. Then in the lower right corner of the tools pane (you probably need to scroll down), is iClicker Student Registration. You can share an iClicker with someone in a different class, but not with someone in the same class. More answers here. For each iClicker question, you get one point for answering plus one point to answering correctly. There is little difference between the two sessions, though the problem session is slightly more focused on working problems than discussion session. Usually, there is enough time for you to ask any question at either session. Problem Session ends early if there are no more student questions. You must bring your Scantron form, and two soft pencils with you to quizzes, and know your Student ID. The old forms won’t work. Fill out your student ID ahead of time. Please do not fold your Scantron sheet. There are 10 closed-book quizzes, given every Friday. One note-sheet 6 in by 4 in is allowed. You must know some basic equations (e.g., F = ma); any equations beyond those will be given. I will post ahead of time the formulas that will be given on the quiz. Quiz scores and correct answers will be posted on the web. Your overall quiz grade will be computed from your best 8 of the 10 quizzes; two quizzes can therefore be missed without penalty. The purpose of dropping two quizzes is to accommodate unavoidable conflicts for medical, academic, athletic, or other reasons. The purpose is not to improve your grade. There are no make-up quizzes. If you anticipate missing more than two quizzes you will likely have to drop or withdraw from the class. The quizzes are multiple choice and approximately 10 questions. I recommend you fill in your 9-digit Student ID (use “1” for “A”) before coming to class. We do not use the “Exam number” field. Quizzes may ask about any concept used in HW, Reading Quizzes, or iClicker questions. They are not necessarily simply rehashed HW questions with different numbers. All quizzes are cumulative, and may include anything covered so far. You will need a calculator (but may not use a laptop or phone) during the quiz. You may wish to bring some blank scratch paper as well. Your student I.D. is required to take the final exam. The final will be just a big quiz: a closed-book exam, with no note sheets, and uniformly cover the whole course. It will be multiple choice questions, just like the quizzes. As always, you must bring a Scantron form (same as quizzes) with you, and a calculator (but not a laptop or phone). You may wish to bring some blank scratch paper as well. There will be approximately 30 questions. I consider many factors in setting the cut-lines for the final letter grades. To be fair to everyone, I choose the cuts from a blind list of course scores. The spreadsheet does the rest. Please do not ask me to change your grade. The final grade weighting will be determined when all the scores are in, as part of the overall grading process. See course overview slides for grading. See TritonEd and E. Michelsen’s notes. Most of this syllabus and material is reproduced with permission from Eric Michelsen‘s course.